The few western travelers who stay here, and see more than just the bus station, are primarily history buffs who are also interested in getting off the main tourist trail. Unsurprisingly, the very few tourists we met here were mostly French and of course Vietnamese. A stop in Dien Bien Phu is often included on bus tours made by the locals and we have met Vietnamese tourists from as far away as Ho Chi Minh City. A number of budget hotels and numerous Vietnamese restaurants can be found near the town center, most of which are conveniently located near the historical sites. Like most of the less traveled towns in northern Vietnam, hotels and restaurants are very reasonably priced. With so few tourists in this region, very few of the locals speak more than a few words of English so visitors must be creative when attempting to order a meal. Google Translate comes in very handy when the menu has no pictures. ​On November 20th 1953 the French Far East Expeditionary Corps, under the command of General Henri Navarre, began building a base at the site of a former WWII Japanese air strip in the remote town of Điện Biên Phủ. Navarre’s goal was to cut off the Viet Minh’s supply lines with Laos (6 miles to the east) and to draw his elusive adversaries out into the open where they would be defeated in a conventional battle. Situated in a valley surrounded by the mountains of northwestern Vietnam, 9000 French troops initially parachuted in to build the base. Four days after the French began construction, Vietnamese General Võ Nguyên Giáp began attacking the outpost. In reality, these early skirmishes were only intelligence gathering missions designed to probe French defenses and determine the type, amount and position of their artillery pieces. Meanwhile, Viet Minh soldiers, conscripted laborers and minority hill people cleared swaths of dense forest and built roads to drag over 200 artillery pieces into hillside positions overlooking the French base. 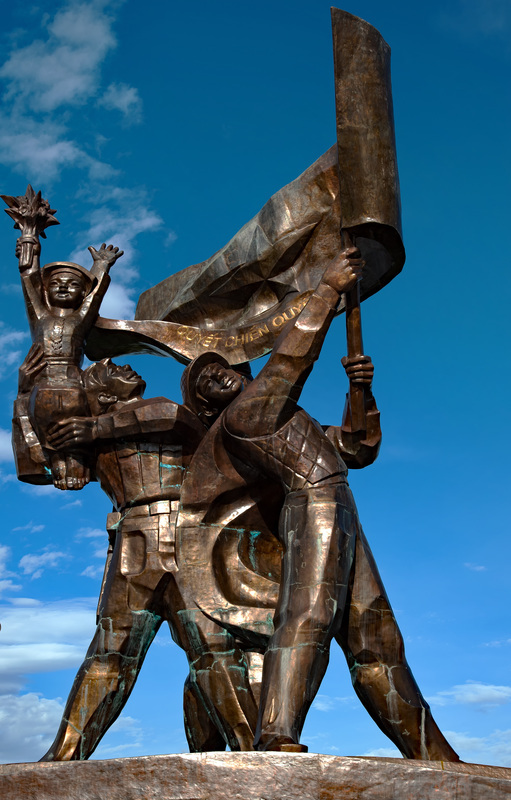 Artillery rounds began raining down of the French on March 13th 1954 and would continue until the Vietnamese and their Chinese allies overran the base and declared victory on May 7th. It was a horrific battle of attrition, resulting in over 15,000 causalities and 6,000 dead on the battlefield. An additional 8000 French troops would perish as POWs. The resulting French defeat ended the colonial era in Indochina and was a prelude to increased U.S. intervention. ​Most of the sprawling battlefield has long since disappeared, cleared and covered over by the present day town of Dien Bien Phu. However, there are a number of battle sites that have been preserved and restored as monuments to those who fell. A good place to start a tour of the town is at the Dien Bien Phu Victory Museum. This excellent museum displays a large number of photos, maps and artifacts from the battle with descriptions in Vietnamese, French and English. The museum is air-conditioned and makes a great way to get out of the heat, but be aware that it is closed daily between the hours of 11:00 a.m. and 1:30 p.m. Across the road from the museum is the Martyrs’ Cemetery, where many of the battle’s soldiers have come to rest in unmarked graves. Overlooking the cemetery just to the north is Hill A1, known to the French as Eliane II. 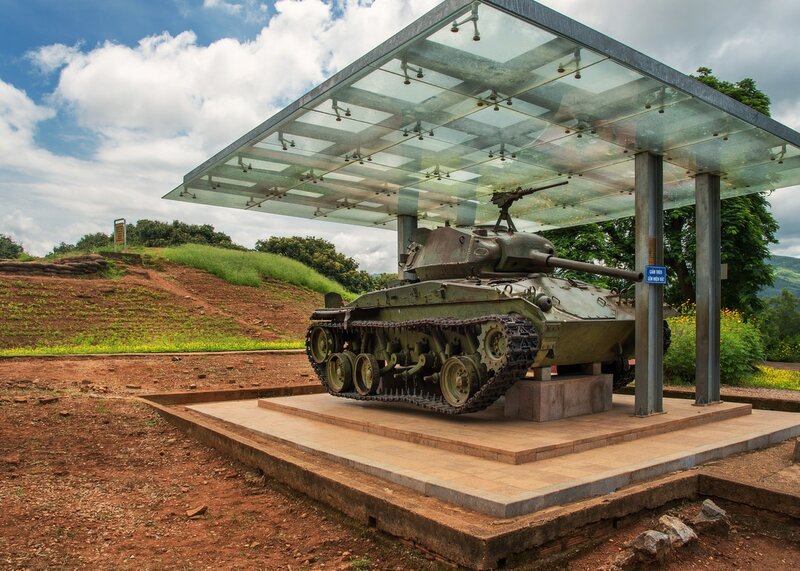 This preserved battle site was where some of the fiercest fighting took place before it fell to the Vietnamese on May 6th. Here visitors will see the main bunker complex, trenches and various monuments to Vietnamese solders as well as a small museum. Unfortunately, all signage is only in Vietnamese so it makes sense to study about the battle before arriving at the site. To the north of Eliane II is Dominique II or Hill D1, which has one very large monument dedicated to the Vietnamese fighting men at the top of the hill. 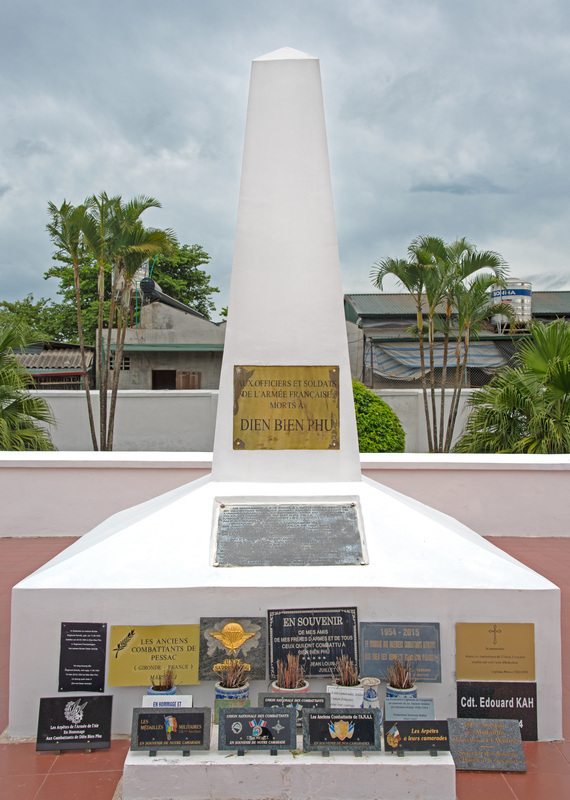 There are also a number of monuments on the east side of the Nam Yum River including the French Command bunker (Colonel de Castries’s bunker), the French Soldiers Monument and a handful of small monuments to the Vietnamese. All of these sites are within walking distance of the town center and can be seen in one day if you rush. With the exception of the cemetery, all the major sites charge an admission price of 15,000 VND each. Dien Bien Phu can most easily be reached by plane from Hanoi’s Noi Bai airport (HAN). Vietnam Airlines runs two daily flights with a flying time of just over one hour. Busses to Dien Bien Phu are available from Hanoi (10-12 hrs), Lao Cai Province (8-10 hrs) and Lai Chau Province (6-8 hrs). From Sa Pa town there are daily mini busses (8 hrs) and overnight busses which make the trip in 9-11 hours. Busses depart Laos daily from Oudomaxay (8-9 hrs) and Muang Khua (4-5 hrs). ​Travelers crossing overland between Vietnam and Laos will pass through the Tay Trang border crossing point located 31 miles (50 km) southwest of Dien Bien Phu. 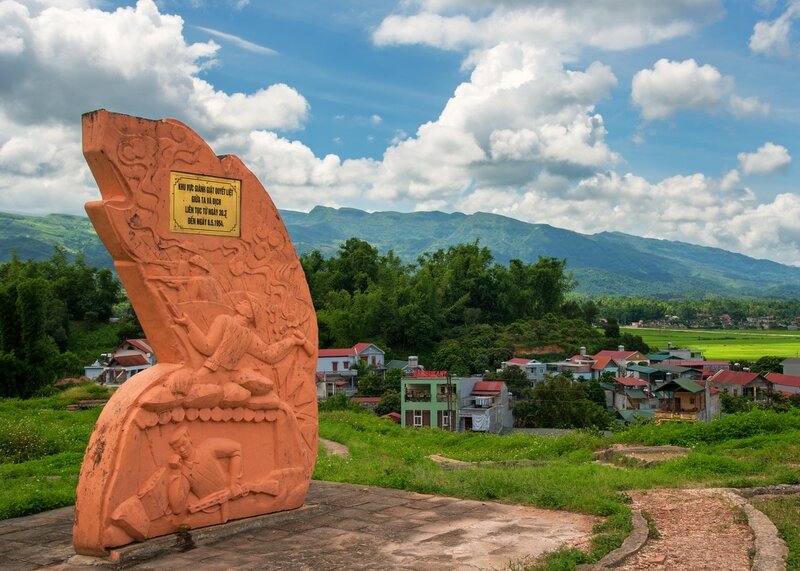 Clearing out of Laos and into Vietnam at this checkpoint is straightforward and hassle-free. Please note that on weekends and holidays the officials on the Laos side of the border charge a 10,000 LAK (1.25 USD) over-time fee. Tourists from certain Asian and European countries can enter Vietnam visa free for periods of stay between 14-30 days. North and South Americans and travelers who wish to remain in the country for a longer stay must obtain a tourist visa. Travelers arriving at one of the major airports can take advantage of the Visa on Arrival Program. Visitors, who wish to participate in VOA, should contact one of the many online visa service providers such as vietnam visa pro. It is important to note that travelers arriving in Vietnam overland can not utilize VOA and must have a visa in their passports before arriving at the border. Beginning in February 2017 Vietnam will start issuing 30 day single entry tourist visas on-line. This new electronic (evisa) program will be available to nationals from 40 countries. It is our understanding that the visa is currently accepted at all land border crossing points.